Nice to see you, how ya doing? Today I’ve got a post about some products that are BRAND NEW to me! After a bit of research, I think that these have actually been out for longer than I thought, but I have never even heard of them before, so they’re definitely brand new to me! This is the skincare saviours range from Soap and Glory! And, as I have a partnership with them, they kindly sent over these products completely to my surprise. Actually, these products couldn’t have arrived at a better time! They arrived on a Saturday morning just as I was about to hop in the bath and pamper myself ready for a party on Saturday night, so you can bet that I decided to trial them STRAIGHT away! (I waste no time getting stuck into exciting products trusssssst me). Obviously, as an avid hot cloth cleanse lover, this product excited me a lot. I usually use a hot cloth cleanser on an evening just before bed as I find that the ritual of the cloth really relaxes me and helps me sleep, I would urge you to try it for sure! This cleanser applies quite thick, but sinks into the skin so quickly! And it comes complete with muslin cloth to remove the excess product. It smells unlike any other hot cloth cleanse I have tried, but it’s a very Soap and Glory scent for sure. Floral, almost, and I. am. a. fan. My skin feels truly cleansed and purified after using, and even looks radiant and moisturised, too! I am actually pretty rubbish when it comes to using products like this. I always buy them, but I often see little difference so give up on them after a few weeks. However, I can safely say, I have not done that with this one. This facial wash smells amazing, looks cool, is easy to use, and OMG does it work!! The first time I used this I genuinely texted people I know telling them that I feel like I’ve been given brand new skin- I felt like a baby again! That’s probably thanks to the super-tasking vitamins, minerals, amino acids as well as the Superfruit YUZU complex- which is a Soap and Glory exclusive, so you cannot get a cleanse like this anywhereeeee else. My skin feels tight, clean, smooth and exfoliated after using this EVERY use. Hold me. I think I’ve found my holy grail. This is so gentle on the skin!! Usually after using a product with beads in like this, my skin is a bit pink afterwards. But, thanks to the ultra-soft, jojoba scrub-beads, my skin can feel the cleanest that it has done since I exited the womb without any redness. To be honest, I can genuinely say that I don’t think I will ever try another face scrub ever again. I have found the one for me! How many times can you say “OMG I LOVE THIS PRODUCT” in a blog post before it’s too many? Asking for a friend…. I mean, let’s be honest, I knew I was gonna love this as soon as I read the name! Peach is one of my favourite scents ever and I would love for my face to smell like that. This is a really effective cleanser to remove makeup with! The first time I tried it was a Saturday night after a party where I had full face full glam, and I still only needed a tiny pump of this product to remove it all- magic! This is a gentle cleanser which is also really moisturising, and it’s become a staple in my skincare routine. I usually use this morning and night; night to remove my makeup and morning just to perk my skin up a bit (and because I love it so much that I cannot limit myself to only using it once a day, haha help). After constant use, I did find my skin just generally appearing clearer and healthier. 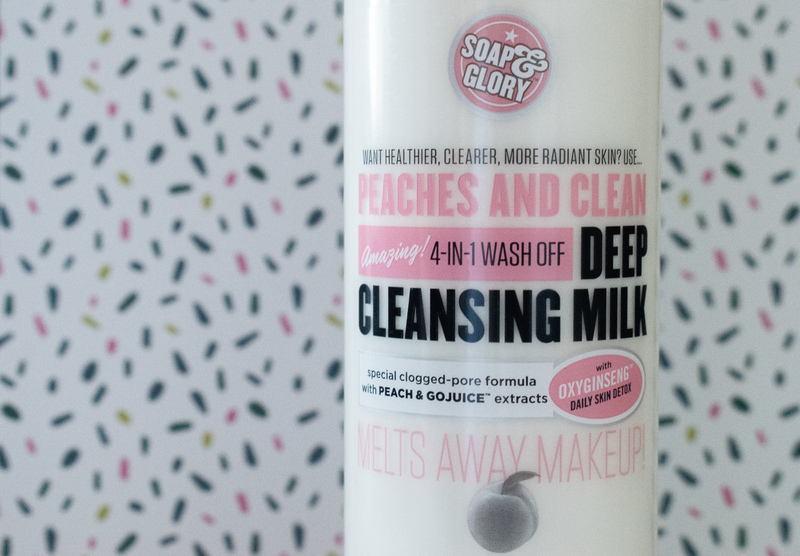 Obviously, this will be down to a combination of all of the products in this post, but goshhhh I am living my best skin life thanks to Soap and Glory! I saved this one for a day when I was feeling super run down, and I’m so glad that I did! I thought that this would be like the other cloth-type eye patches that I’ve used before and, to be honest, they annoy me a bit because they always fall off. But, these ones are actually gel so they stick to your face and you can actually move around with them on; winner! They smelt lovely and refreshing, like cucumber, and I really enjoyed the little tingle that they created. Just pop them on for 20-30 mins and then remove and massage any excess gel into the skin and get ready for your under eyes to look and feel super refreshed. 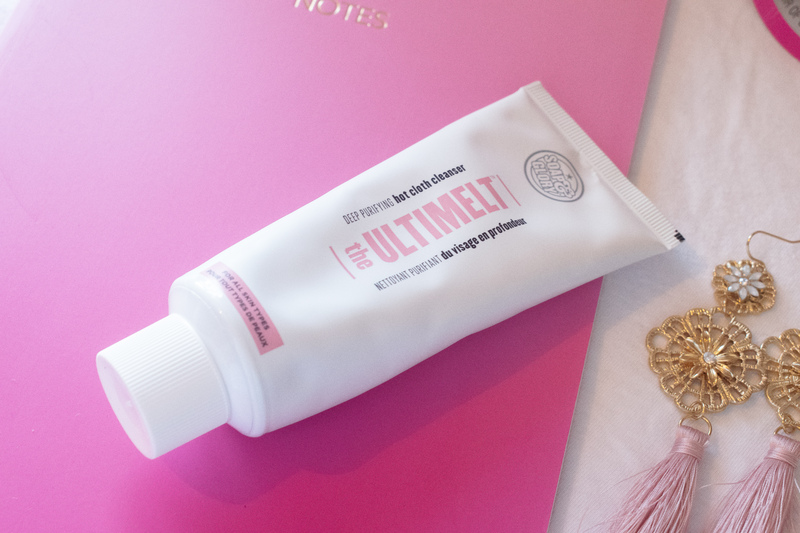 As I’ve banged on about these products so much in this post, I thought that it would only be right to tell you the actual routine in which I’m using them at the moment! So, as I said earlier, I’m using Peaches and Clean in a morning to give my skin a boost, as well as using it in the first step of my nighttime routine to remove my makeup. I am using Face Soap and Clarity in the shower as I find that to be the best time to fit it in, personally. And, I am finishing off with the Ultimelt every night before bed! The Puffy Eye Attack is reserved for special occasions, when my under-eyes need some extra loving. Have you ever tried any of these products? Let me know in the comments. I used to LOVE the peaches and clean cleanser – completely forgot about it until now!! I love the sound of the hot cloth cleanser too. Next Post The Wedding Diaries; Save The Date!